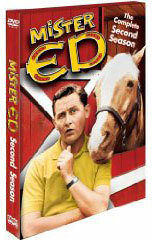 The 1961-62 second season, which is being released on DVD next week, of the very good ‘60s supernatural sitcom Mister Ed is notable for many reasons. One reason is that this season was the first one that ran on CBS after the first season of the show aired in syndication. A second reason that the second season was special was that it was an early example of a “fun” show that ran on Sunday evenings to help kids relax before facing school and adults facing work the next day. The show additionally provides an amusing look at a typical ‘60s family in which the wife kept house and experienced jealousy and the husband complained about the bills. The fact that the romantic rival was horse was unique. Further, the DVD set is being released a few weeks after the death of series star Connie Hines, who played housewife Carol Post. There were no reports that Mr. Ed’s head was discovered in her bed. Special guest stars were a common theme of the second season. Zsa Zsa “I don’t want to go to jail because I am afraid of lesbians” Gabor and Clint “Mr. Mayor” Eastwood moved into separate homes in the neighborhood where Wilbur and Carol Post shared their home with Wilbur’s talking horse. Additionally, Wilbur pitched the idea of a talking horse act to comedian George Burns over the objections of said horse. Numerous sitcom stars also appeared in guest roles. Hayden Rorke of I Dream of Jeannie played an interior decorator, Alan Hale, Jr., of Gilligan’s Island played a college classmate of Wilbur’s, and Donna Douglas of The Beverly Hillbillies played the main squeeze of both Hale and Eastwood in separate episodes. In another interesting note, Burns’ office was the same set that was used for Mr. Drysdale’s office on Hillbillies. Regardless of whether a guest star appeared, many of the 26 episodes revolved around Ed’s lack of self-control causing mayhem that got resolved roughly 20 minutes into the show. His hijinks included eating neighbor Roger Addison’s apples, tormenting Eastwood because of a romantic rivalry with Eastwood’s horse, and ordering a king-sized bed for his stall. Ed additionally demanded enough attention and care from Wilbur to create conflict with Carol. Seeing Wilbur pulled in two directions was very amusing. The extras consisted of vintage Studebaker car commercials starring the Ed cast, and an audio recording of an interview that Hines and her co-star Alan Young did for an Internet-based radio program. Human and animal fans of Ed are encouraged to e-mail me at tvdvdguy@gmail.com. Following a very successful first season in syndication, Mister Ed moved on to greener pastures in the fall of 1961 when CBS picked up the show for national broadcast and added it to their Sunday night lineup. Here are all 26 episodes from the second season of the classic TV sitcom. Architect Wilbur Post (Alan Young, The Time Machine) and his wife Carol (Connie Hines) are once again up to their ears in trouble, and hilarity, with all of the mischief brought on by their meddlesome talking horse. This season features a star-studded array of celebrities who appear on the show, including George Burns (the shows original producer), Zsa Zsa Gabor and Clint Eastwood.